Neurologists, and other clinicians responsible for the care of patients with multiple sclerosis. The Hilton San Diego Bayfront will host the Advanced Curriculum for Multiple Sclerosis and ACTRIMS Forum 2018. AcademicCME designates this live program for a maximum of 15.00 AMA PRA Category 1 Credit(s)™. Physicians should claim only the credit commensurate with the extent of their participation in the activity. This activity has been supported by independent educational grants from AbbVie Inc; Biogen; Celgene Corporation; and Novartis Pharmaceuticals Corporation. Event Staff will be glad to assist you with any special needs (ie, physical, dietary, etc). Please contact us prior to the live event by emailing requests to [email protected]. 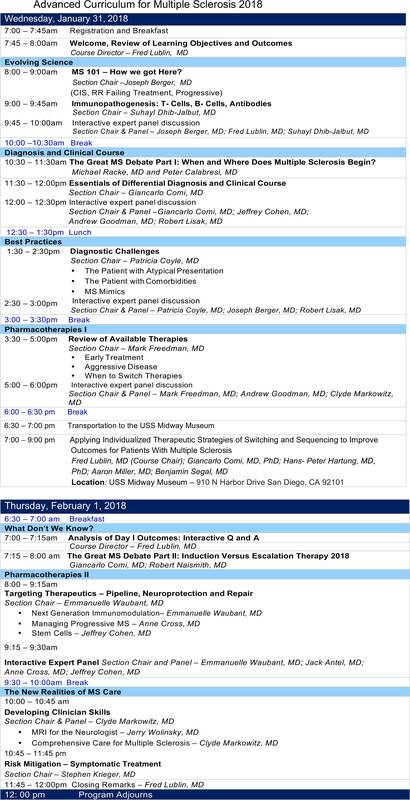 To register for the complimentary, dinner symposium during the Advanced Curriculum for Multiple Sclerosis 2018, please visit: http://academiccme.com/ms2018/. This CME program will be held on Wednesday, January 31st from 7:00 – 9:00 pm aboard the USS Midway Museum.